In the 10 years since JCDecaux launched its first bike-share program in Vienna, Austria, 300,000,000 riders have hopped on a JCDecaux-operated service, including CityBike, vélo'v, Sevici, CityCycle, bicloo, Vélib', or another CycloCity bicycle! With 66 cities in 10 countries using a CycloCity bike-share system, JCDecaux is one of the dominate bike-share providers even though it is not their main business. 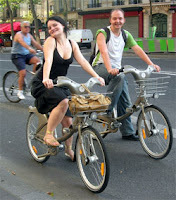 Vélib' in Paris, the largest of the CycloCity systems, accounted for 157,000,000 of these rides according to e-marketing France. Throughout the the world, over 550,00 subscribers have joined one of their systems. In a review of JCDecaux's CycloCity system, Bourcier.com, states that the 46,536 bicycles in its world wide fleet are responsible for alleviating 33,899 metric tons of CO2 from going into the atmosphere each year. This proves what we always knew, that bike-sharing is like a breath of fresh air! 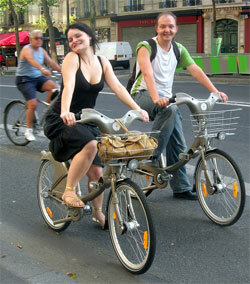 The Bike-sharing World Map is the #1 resource for bike-sharing systems world wide. It shows new systems coming online which might not be covered in The Bike-sharing Blog. With constant updates, it is one of the best ways to keep up with the ever changing bike-sharing world.